Places to Visit in Costa Rica. Costa Rica which is also known as Republic Of Costa Rica, is a small country located in Central America surrounded by Nicaragua to the north, Panama to the south, the Pacific Ocean to the west and the Caribbean Sea to the east. Costa Rica is famous as a nature travel destination because of its well-established national parks and protected areas with variety of rich flora and fauna. Every year large number of tourist visit Costa Rica for the activities related to ecotourism such trekking, flora, fauna, and bird watching, visits to rural communities. The country is also renowned for its beautiful beaches in Pacific Ocean, Caribbean Sea and active volcanoes and eco-friendly all-inclusive resorts also known as eco-resorts. These are the same reasons that I’ve visited Costa Rica and long to go back. So, if you are planning a vacation this year, Costa Rica is the perfect destination for you. Here is a brief guide, to let you know the Top 10 Best Places that you must visit if you decide to travel to Costa Rica this year. Poás Volcano National Park is the most visited national park in Costa Rica which covers an area of 65 kilometers. The major attraction of the park is the active volcano. The main crater is around 290 meters deep which is the largest in the world and it is quite active with frequent small geyser and lava eruptions. The expedition to the main crater starts with a hike to the edge of the crater. There are two more craters the inactive Von Frantzuis crater and the Botos crater.Lake Botos and La Paz Waterfall are also some best places to visit in the park. The park also consist of vivid variety of flora and fauna such as Poas magnolia tree, Bangs’s mountain squirrel, clay-colored robin, black guan, resplendent quetzal, hummingbirds, tanagers, flycatchers and toucans. Mammals in the park include coyotes, rabbits and marmots. Arenal Volcano National Park is another Costa Rican national park in the center of the country. The park encompasses the Arenal Volcano which is the most active volcano in the country and the major attraction among the tourist in this park, there is a major eruption in this volcano in 1968. Other locations to visit in this national park are Chato volcano and Lake Arenal. If you are looking for adventure, relaxation or wanted to experience the nature this park offers everything. Tourists can enjoy zip lining tours, white water rafting tours, hiking trails, hanging bridges and more. In and around the park you will also find various all-inclusive resorts and hotels focused on the wild life of the area with own hot springs and spas. Manuel Antonio National Park, a small national park located in the Pacific coast of Costa Rica in Central Pacific Conservation Area. The park is famous for its beautiful landscapes with white sand beaches and lush vegetation. It is also known for its diverse land and marine eco-system.. Every year around 150,000 tourists visits this park because of its excellent climate and scenic beauty. Tourist can also enjoy activities like white water rafting, snorkeling tours, fishing tours etc. Corcovado National Park, largest park located in southwestern part of Costa Rica in Osa Conservation Area. The park is famous for its stunning ecological variety. This place is not only famous for its tropical ecology but visitors will also find abundance of wildlife. It is biologically the most intense place on earth in terms biodiversity”. Corcovado conserves the largest primary forest and also home to many endangered species such as Baird’s tapir and Harpy eagle. This park is a heaven for nature enthusiasts. Tortuguero National Park, this park is located in northeastern part of the country in within the Tortuguero Conservation Area. This park is known for its set of water canals and large variety of biological diversity. It is the third most visited park in Costa Rica and only way to reach the park either through boats or domestic flight. It is recommended travel at least one way through the canal, which is also an amazing experience. Tortuguero is also very famous because of Green Turtle nesting. Every year from August to October, turtles comes to nest there eggs here. And that’s from where this park gets its name. Tamarindo is located northern Pacific Coast of Costa Rica in Province of Guanacaste. With spectacular beach, estuary, number of surf spots, deep blue sport fishing and eco-tourism, it’s quite a popular destination among couples and families. Tourist can also enjoy activities like scuba diving, snorkeling, surfing, horseback riding and golfing. Papagayo Peninsula is located in north Pacific coast of the Costa Rica northwest province of Guanacaste. This place is famous for its 15 miles of coastline which consist of 31 separate beaches and the famous Four Seasons Resort Costa Rica with Andaz Peninsula Papagayo the only 2 resorts in the site. Since the majority of Papagayo Peninsula is unspoiled, it a good place for outdoor exploration. Available outdoor activities here is deep-sea fishing, boat cruising, snorkeling, scuba diving, surfing, kayaking, rafting, canopy tours, horseback riding, hiking trips to nearby National parks and visits to nearby villages. Monteverde Cloud Forest, a Costa Rican reserve located in the Puntarenas and Alajuela provinces. This place is famous for its 10,500 hectares of cloud forest, which is visited every year by around 70,000 of tourists. Reserve extreme high biodiversity is home from around 2500 plant species, 100 species of mammals, 400 bird species, 120 reptilian and amphibians and 1000 of insects. This reserve is a mecca for scientists and nature enthusiasts. Chirripo National Park is national park of Costa Rica spanning over 3 provinces of San Jose, Limon and Cartago. It is established in 1975 which is named after Cerro Chirripo, the highest mountain in Costa Rica. It is also the main attraction among tourists visiting this national park. Summiting the peak starts with a 16.5 kilometers of hike from the town of San Gerardo de Rivas to the ranger refuge which is followed by a 5 kilometers of walk to the peak. San Jose is the largest city in Costa Rica, in fact, it is the capital of this beautiful country. It is located in the center of the lush green valley and mountains. San Jose is the hub of political, economic and transportation activities. It is also the seat of national government. European Inspired Architecture and numerous cultural, musical, and artistic presentations and activities is the main tourist attraction here. There are lots of theaters, museums, parks and zoos to visit such as The National Theatre of Costa Rica, The Melico Salazar Theatre, The Children’s Museum of Costa Rica, The National Museum of Costa Rica, The Museum of Pre-Columbian Gold, The Museum of Costa Rican Art, The National Park, Morazan Park, La Sabana Metropolitan Park, Peace Park and Simon Bolívar Zoo. I’ve already visited some of these places on my trip to Costa Rica and I am aching to go back, it really is my top destination thus far! Which place would you most like to visit in Costa Rica? Spot the difference! your all inclusive resorts vacations are waiting! Previous Post: « 9 Simple Ways to Be Happier Everyday–The Simplicity Curve! Wow, there are so many beautiful places to visit in Costa Rica! I would LOVE to check out those volcano parks. I love all the photos it must be amazing to visit place like this. My daughter is going in may i showed her this post,she’s getting excited! OMG, that is awesome. She will love it there. Oh Nancy you were so correct she came back tanned ans with loads of photo’s and is planning her next trip. Kathy, that is so great to hear! I love Costa Rica, it has my heart! I was excited to see this post! I plan to go to Costa Rica in the next few years and these are great ideas. Have heard so many great things about Costa Rica, maybe one day we will get to visit and check it out. My daughter is going on vacation there next month and i have been telling her about all the amazing things about the place,she is so excited . That is amazing! Hope she has fun! Thanks for all the photos someday i may get there! 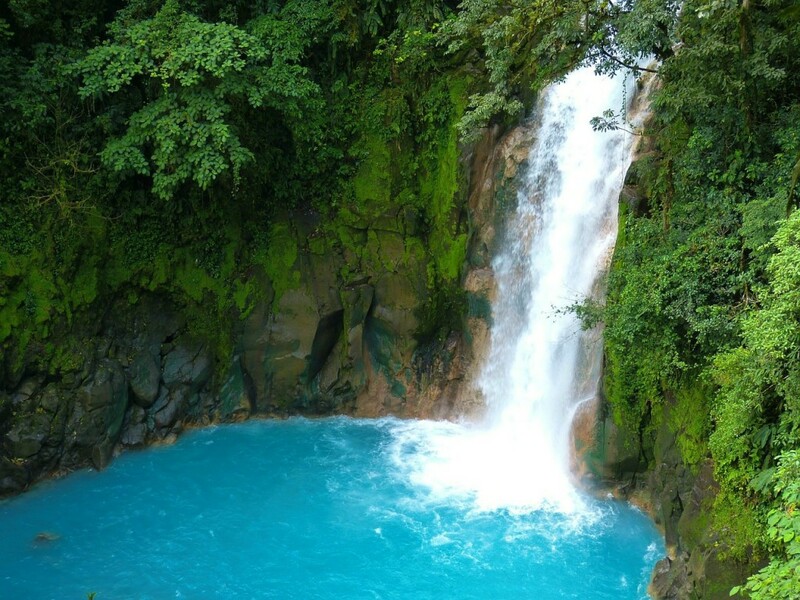 Costa rica should be on everyone’s bucket list.